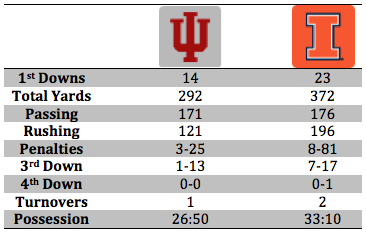 The Hoosiers defense kept the Illini offense at bay in a 31-17 win in Champaign. Welcome back as we finally have another win to review in our Throwback Series. This is one of the weirder games when it comes to breaking down the statistics. Illinois lead in almost every major category, yet lost the game by 14 points. This was a crazy game filled with lots of twists and turns as the Hoosiers pulled their starting quarterback in favor of a true freshman in the first quarter and led the Hoosier comeback. 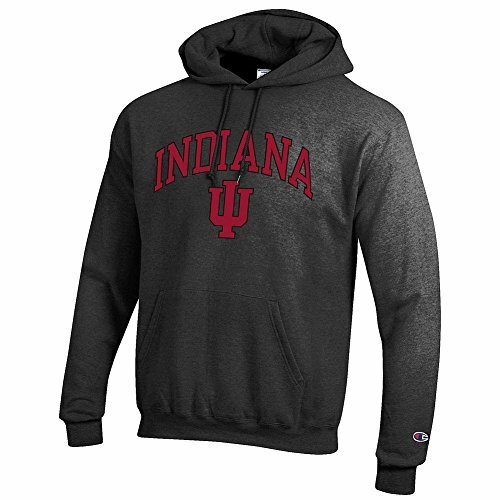 The Hoosiers face the Illini annually as they share the Leaders division. The Illini came into the game leading the board war series 45-22-5 over the Hoosiers. This rivalry does not carry the same heat on the gridiron as it does on the hardwood, however that does not take away from the meaning of this game. Coming into the game both teams were winless in conference and the Hoosiers were seeking their first Big Ten triumph since Bill Lynch rode off into the sunset with a win over hated Purdue in 2010. Stephen Houston, RB, Indiana- While the running back only totaled 87 yards for the game, Houston found the promised land three times. Houston settled the Hoosier offense down and kept Indiana in the game early and allowed them to pull away late. Nate Sudfeld, QB, Indiana- The true freshman came into the game and replaced a struggling Cam Coffman in the first quarter. Sudfeld filled in admirably as he threw for two scores and did not turn the ball over. Donovan Young, RB, Illinois- The sophomore runner had himself a very solid day, rushing for 124 yards while adding 21 through the air. Young did the heavy lifting for an Illini squad who ran the ball 55 times. Nathan Scheelhaase, QB, Illinois- The dynamic quarterback always gives it his all when he plays the Hoosiers. While he was not his usual dominant self, Scheelhaase did put forth a valiant effort accounting for 2 touchdowns and 208 yards. David Cooper, LB, Indiana- The man in the middle was a force for the Hoosiers all day as he racked up 10 total tackles and a whopping three tackles for a loss. Cooper was a nightmare for the Illini as he and the Hoosier defense held the normally pesky Scheelhaase to just 32 yards on 26 carries. Jonathon Brown, LB, Illinois- The future NFL draft pick did not disappoint as he was a monster on the defensive side of the ball for the Illini. Brown recorded 11 total tackles and two for a loss. The Hoosier special teams unit was solid in the win versus the Illini hitting all four extra points and was a perfect one-for-one on field goals. The punt game took a step back as Erich Toth averaged only 39.3 yards on seven punts. However, the special teams came up with one of the plays of the game, recovering a muffed kick that resulted in a Hoosiers touchdown. The Indiana defense recorded seven sacks in the game keeping the Illini offense at bay. The Hoosier defensive front seven was a thorn in the side of quarterback Nathan Scheelhaase all day, as he could not get into a rhythm. This game was looking like a back and forth battle until the Hoosiers decided to punt with the score tied 14 all and Illini returner Tommy Davis muffed that punt. The fumble was recovered by Indiana safety Greg Heban and the Hoosiers went on to score 17 of the next 20 points and the Illini were never really in the game after that. Nate Sudfeld completed a 17-yard touchdown pass to Shane Wynn to give the Hoosiers a 14 point lead with five and a half minutes left. Indiana, Defensive Line- Its difficult to pick just one guy off the unit that recorded four sacks and 6.5 TFL’s. The whole line really put forth a top flight performance and wrecked havoc on the Illini offense all day. Illinois- Donovan Young, Running Back- The running back did his best to end the Illini losing streak, but his effort was in vain as the Hoosiers prevailed 31-17. When you look at the box score the Hoosiers should not have even been in this game yet alone walk away with a 14-point victory, however, a win is a win. Kevin Wilson showed a quick trigger in pulling Coffman for Sudfeld, after the sophomore did not look sharp in the first quarter. While on paper a 14-point victory on the road is quiet impressive, especially for a team that had not won a Big Ten game in nearly two years, however this Illinois team was bad and folded up shop as soon as the game turned in the Hoosiers favor. Honestly this may have been one of the worst offensive performances of the year for Indiana, as they were held to under 300 total yards and were a dismal 1-13 on third down conversions, but a win is a win especially against a Big Ten team on the road.